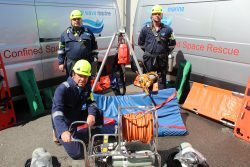 FAMILY business New Wave Marine Limited is going global – with it’s new ‘International Confined Space Rescue Unit’ that is on call 24/7. 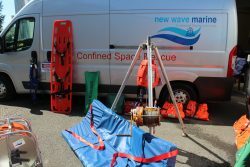 The team of 8 professionals are advanced trained and can work in any hostile environments, said Darren Negus, operations manager at New Wave Marine. 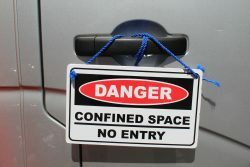 “Our team is trained to work in technically confined spaces and dangerous atmospheres that involves the rescue and recovery of victims trapped in a confined space or, in a place only accessible through confined spaces, such as underground vaults, storage silos, storage tanks,” he said. 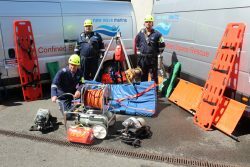 “Our company is growing and in negotiations at moving to a bigger site in Plymouth that will house our fleet of vehicles, domestic, waste management, and marine services teams,” he said. Meanwhile, the team at New Wave Marine are celebrating after winning the South & South West business of the Year Award ‘People’s Choice Award’ in central London recently. Over 200 family businesses of all sizes and sectors from across the UK attended the event, at the Mayfair Hotel in the heart of London. “Family firms have much to celebrate and that it continues to support many families and the communities in which they operate,” said Mr Andrews.